There is no secret that I love luxury handbags. However, I am definitely a thrifty girl when it comes to shopping. 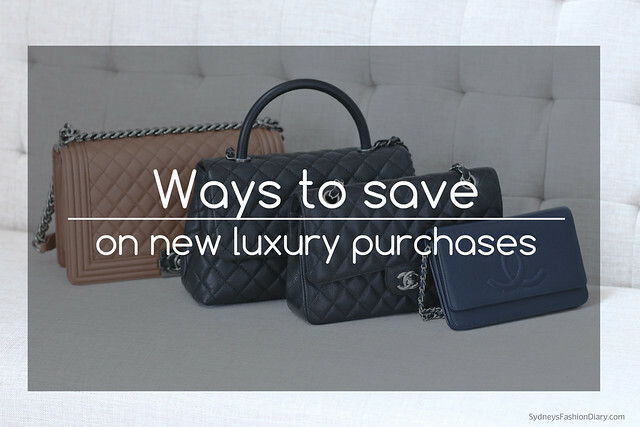 Over the years, I have learned a few tricks on how to save a bit of cash on luxury purchases. Please note that these tips apply to new handbags. Of course, you can always save money on pre-owned ones (read my tips and tricks here). FYI, I have a stunning Chanel boy bag for sale here if you're interested. Trick # 1: Open a store credit card and get 10% off your first purchase. That's what I did with my Chanel boy. It was purchased from the Chanel boutique inside Saks. I opened a Saks credit card and the SA took 10% off my purchase. 10% doesn't seem like a whole lot but when you make a large purchase, the savings is significant. I saved $520 on my beloved boy bag. Trick # 2: Purchase from an out-of-state retailer: There are no high-end department stores like Neiman Marcus or Barneys in Ohio. Therefore, all my out-of-state purchases are tax-exempt. For the purpose of calculation, the sales tax on a $5000 purchase is roughly $350 in Ohio. You can also take advantage of one of the 5 states with no sales tax (Delaware, Montana, Oregon, New Hampshire and Alaska) - same concept! Trick # 3: Take advantage of reward points: Technically, this isn't a direct savings but you can use your earned points towards future purchases. Saks is current in pre-sell for triple points (sale starts 03/31). This is the best time to make any large purchases as you get the most money back for your gift card. Again, for the purpose of calculation, you would earn a $300 gift card with $5000 purchase. Trick # 4 (this one is new to me): As you may be aware, luxury handbag prices vary from different parts of the globe. However, travel to another country to take advantage of lower prices isn't always practical. For those who live in the mainland US, some (not all) luxury handbags are actually cheaper in Hawaii. I bought my Chanel brooch, earrings and my latest bag from the Chanel boutique in Honolulu and prices were indeed cheaper. The state sales tax rate is also low at 4%. It wasn't a huge deal in terms of the price difference (between $50-$100) on my Chanel pieces but I've heard Prada prices are much cheaper in Hawaii. I hope you find this post helpful. Let me know if you have any questions/tips in the comment section below. Happy Easter, everyone! Great tips Sydney! You carry the cutest statement bags! Happy Easter! !